The most obvious improvements coming in with the Kindle Fire HD are in the hardware. It’s hard to get more attention-catching than the increased screen size provided by the 8.9” model. Most of the really interesting stuff seems to be coming through the software side, though. It’s somewhat harder to lay out in simple graph form, but it’s a lot more interesting. 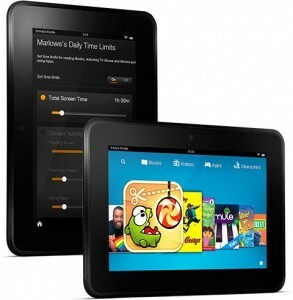 Where the original Kindle Fire ran a modified version of Android 2.3, the new Kindle Fire HD will be using version 4.0. This is the first version of Android made specifically with tablets in mind as well as smartphones, so the inclusion on a larger device is probably an obvious move on Amazon’s part. Between performance improvements and general compatibility issues, however, this is a big improvement. Maybe the parental controls weren’t the biggest issue that the Kindle Fire had in its software design, but the people who needed them were among the loudest of Amazon’s critics. Over time there were various controls added in that more or less meet most needs, but this new version takes things a bit further. FreeTime, as the new service is being called, will allow parents to set specific time restrictions on their devices. This means finely grained control over all sorts of things. Want your kids to be able to read on the tablet and watch the TV shows you’ve downloaded but not run games except from 6pm to 8pm? You can do that now. The X-Ray feature included with the Kindle Touch at its release was an interesting way to access details about your books at a glance. It pulls up things like character names and bios, important locations in the plot, and an assortment of other information. Useful for anybody who needs a refresher after putting down their reading for a bit, even if you don’t factor in the links to Shelfari and Wikipedia. Now the Kindle Fire HD will have that feature for both books and movies. Amazon is touting the ability of their X-Ray for Movies service to tell you who’s on the screen at any given time, link you to their other films, see anything related to the film or actor from IMDB, and more. It’s a fun concept that might win you a Trivial Pursuit game some time. 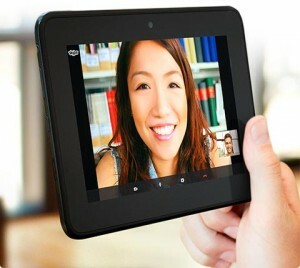 One of the most anticipated hardware improvements in the Kindle Fire HD has been the camera. To make use of this, every device will include a copy of Skype pre-installed. This means instant access to that complete network. Naturally this won’t be the only service you can take advantage of the hardware through, but it is almost certain to be the biggest. Test to Speech software is back thanks to the Kindle Fire HD. It was confusingly missing in the first Kindle Fire and there seems to be no way to get it out of any of the new Kindle eReaders either. Fortunately now it will be present through the tablets, wherever agreements with publishers allow. Is Google Taking On the Kindle Fire With a New 7” Tablet? Until we see Windows 8 hitting shelves, the only real contenders in the tablet market are Apple’s iOS and Google’s Android OS. As much as the BlackBerry PlayBook 2.0 does some great things, most of its newfound strength comes from being able to import Android content. Given the importance of Google’s place as the developer of Android, which while lagging behind iOS is still making rapid gains, it has struck many people as troubling that Amazon would take their software and cut them out of the loop entirely with the release of the Kindle Fire. Despite the fact that it’s not really against any rules, the breaking of that the most popular Android tablet ever from the Android Marketplace and other Google services comes up frequently in Kindle Fire reviews. Now we have reason to believe that Google has taken notice and may be willing to respond. According to recent reports, Google will be releasing their own 7” $200 Kindle Fire competitor as early as early as 2nd Quarter this year. Information is still mostly speculation with regard to the specifics of this new tablet, but supposedly it will run Android 4.0 “Ice Cream Sandwich”, have a 7” 1280 x 800 display, and be introduced in an initial production run of 1.5 – 2 million units. For a new launch early in the year, that indicates fairly strong confidence in their product. For once this may actually be a sufficiently strong product to beat out the competition. Google is in a position to control the entire ecosystem surrounding their device, much like Amazon with the Kindle Fire, but can draw on a much more significant pool of content when providing apps and such. This may be what it takes to approach the iPad in a meaningful way right off the bat. While the most obvious conflict being sought when releasing a 7” tablet will be the Google vs Kindle Fire matchup, Apple’s anticipated iPad 3 will be joining the fray as well with a smaller design that intrigues many potential customers. All of Google’s more recent actions with regard to Android, from the tablet optimization to the automated policing of the Android Marketplace to remove malware and other malicious programs, come together to make this a far more appealing prospect than it could have been a year ago. The Kindle Fire has proven more than anything previously that there is room for more than one big name in the marketplace by overtaking even the most established competing Android devices in a matter of months and setting the new standard for tablet pricing. At worst this rumored tablet would be something that other Android device developers could model their design on with confidence, knowing that Google is already designing with such a configuration in mind. 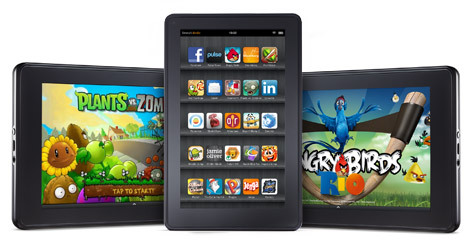 At best, maybe even the Kindle Fire and iPad have something to look out for in the months to come. Until we see concrete details it’s hard to guess which competitor will be targeted directly, but it’s even harder to imagine that Google would settle for anything less than one of the big names in tablets.